CLEARFIELD – Clearfield County Cancer Support Inc. recently received a generous donation from Starr Hill Vineyard & Winery. 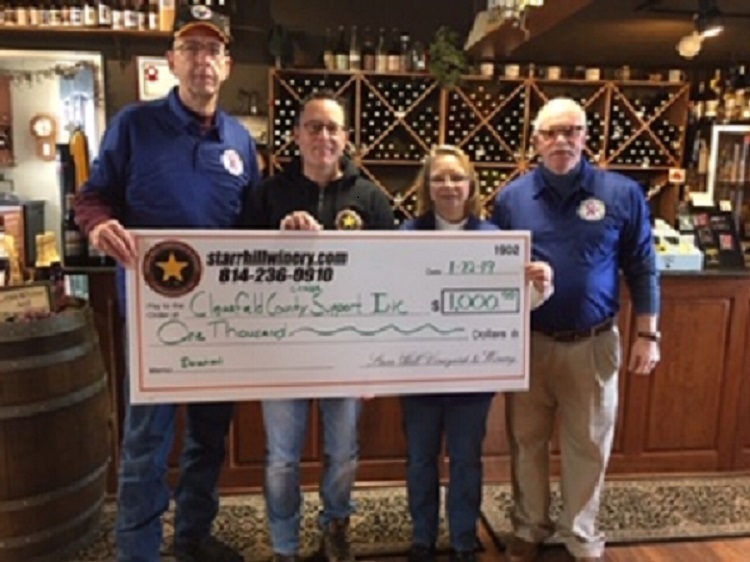 Pictured, from left to right, are Mike Greene, co-founder, CCCS; Ken Starr, owner, Starr Hill; Sonya Greene, co-founder, CCCS; and Jack Machtel, event fundraising chairman. All funds received by CCCS are used to assist local residents going through treatment for cancer, so that they are able to pay monthly expenses. For more information, please visit the charity’s Facebook page. Clearfield County Cancer Support Inc.